Hong Kong « Hercules and the umpire. Via the ferry, Lisa took Zora to Hong Kong yesterday for a doctor’s visit. She ran into the protests. The protests were entirely peaceful. 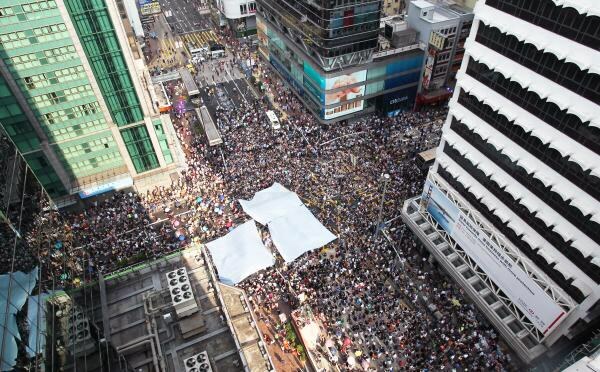 Lisa said it was easy to get around Hong Kong despite the huge crowds. The Chinese hate chaos. 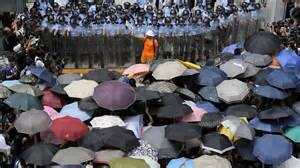 So, it is not all surprising that one could witness a huge protest that was not disruptive. 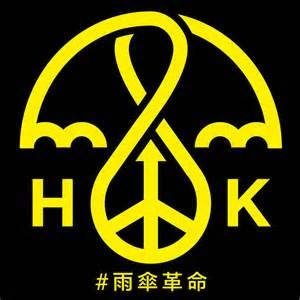 The protests were prompted by the mainland’s decision to limit candidates in the 2017 elections in HK to those approved in Beijing. 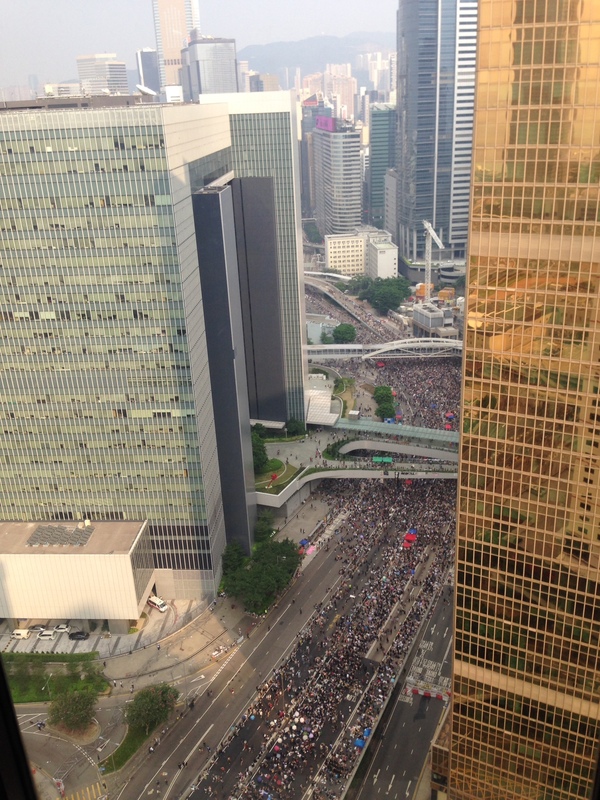 Lisa tells me that Instagram doesn’t work now on the mainland, and search engines will not return results for “Occupy Central.” When the Brits gave up HK, you knew this was destined to happen. It will be utterly fascinating to see how the PRC manages this issue. Typhoon Kalmaegi (the Korean word for seagull) shut down Hong Kong, and Lisa and Karel who live right across the bay felt the impact. In fact, they apparently captured a rare event in a photo. 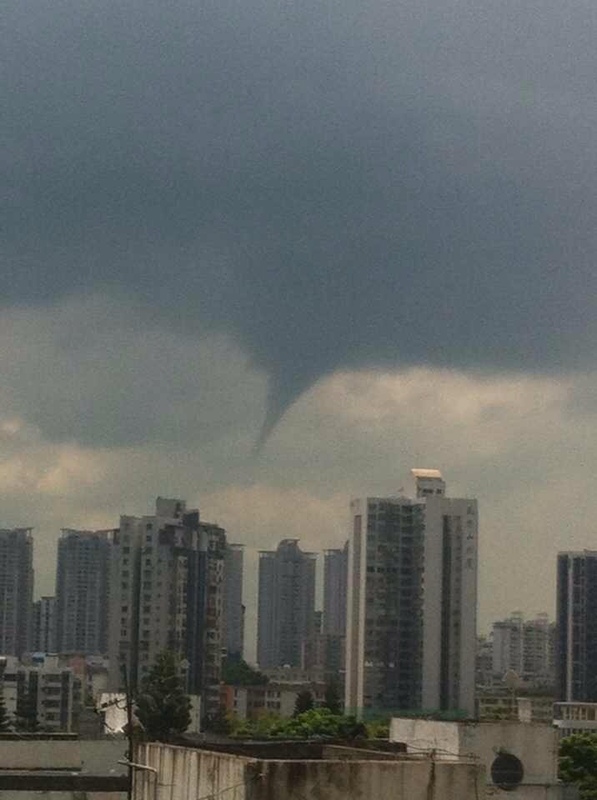 From their high-rise apartment, they took the following pic seemingly showing a tornado floating down from the typhoon’s storm clouds. This photo was taken from Lisa and Karel’s 16th floor apartment in Shekou. By the way, if it looks like there are trees and bushes on the building in the forefront of the photo that is because there is rooftop garden on that building. In the summer, it is pretty. 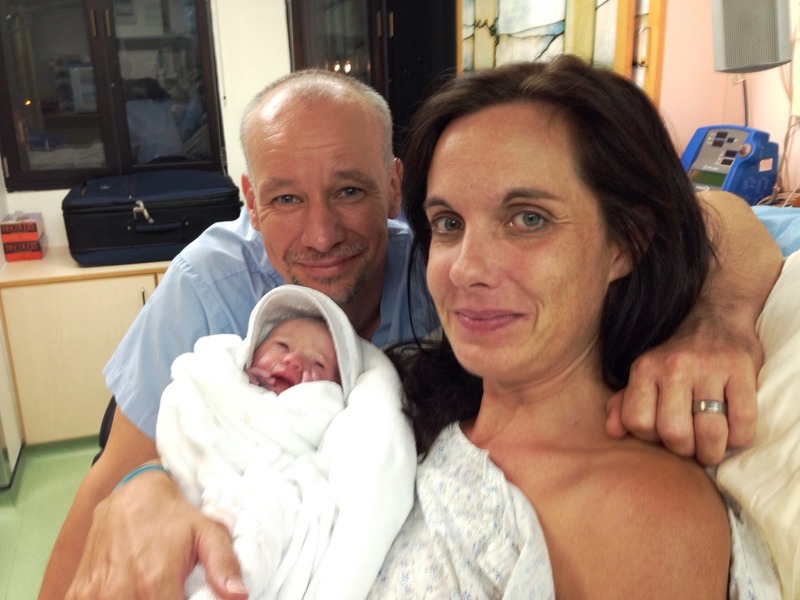 Zora Marie was born September 4, 2014 to Lisa and Karel in the small but picturesque Matilda Hospital in Hong Kong. She was 6.0 pounds in weight and 19 inches long at birth. We heard her sweet coo last night over Facetime. Zora is Czech name and is the equivalent of “Dawn” in English. Karel is a Czech. The beautiful place Zora was born stands on a peak providing 360◦ views of Hong Kong. The hospital’s history is both unique and heart warming. It is perhaps fitting that Granville Sharp and his wife Matilda, newlywed in India and embarking on married life in a Hong Kong by no means established and stable, should make landfall in the Territory on Christmas Day – a time of giving – in 1858. Theirs is a story of fortitude in the face of shipwreck and piracy in the South China seas, grit and determination in the disease-wracked colony and quiet generosity. Above all, however, their lives in Hong Kong stand as a testament to their compassion for the lot of their fellow beings, as exemplified, among many other examples, by Matilda’s work for widows and orphans. While Granville successfully struck out into commerce on his own as so many in Hong Kong have done before and since, Matilda set about relieving suffering wherever she met it, further etching an indelible affection on her husband’s heart as well as that of the Western and Chinese communities she came to know so well. Outliving her by just a few years, Granville set out in his will, in extraordinary detail, his bequest to Hong Kong – a hospital to be constructed “not for the glory of the medical profession . . . but for the benefit, care and happiness of the patient.” The hospital, to be a refuge for all in medical need, was to be called Matilda in loving memory of his departed wife. Photo credit: Expatliving Hong Kong. 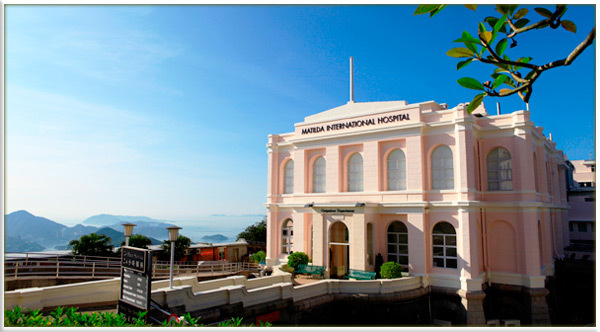 The Matilda International Hospital [MIH] is a 102-bed, not-for-profit hospital. 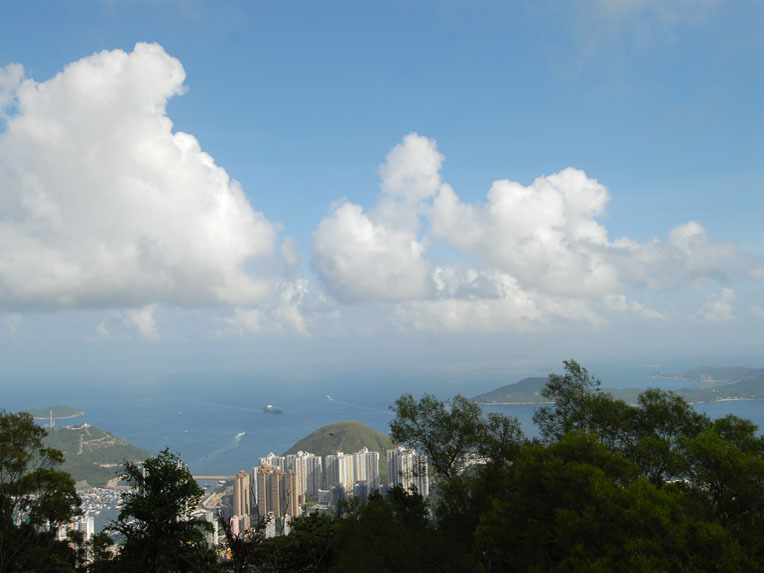 Only 15 minutes from Central Hong Kong, the hospital is situated on its own promontory atop Victoria Peak. It is a perfect place to watch the dawn begin to illuminate the world. Perhaps that will be Zora’s mission too. 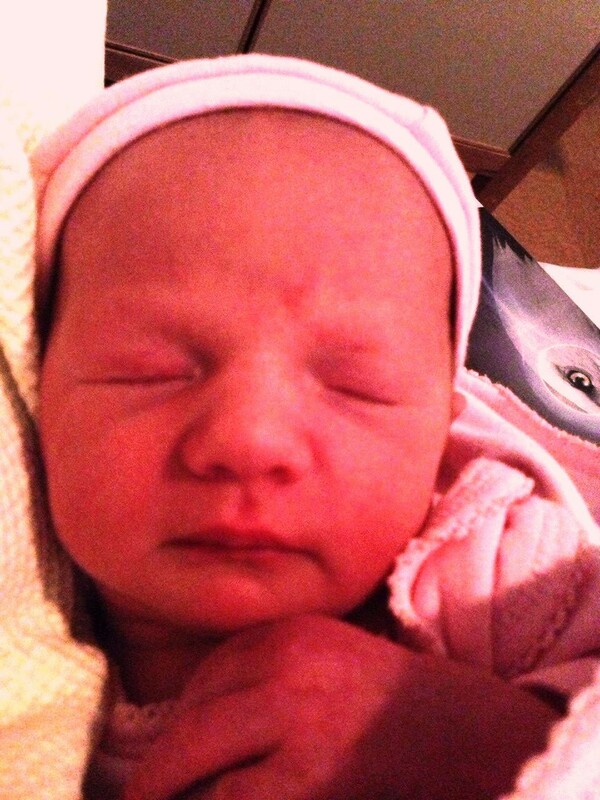 Baby Girl was born today (Sept. 4) at 9:01 PM in Hong Kong to Lisa and Karel. Baby is perfect; both mother and baby are doing well. No further details yet.